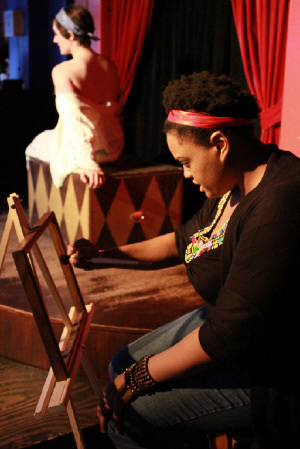 Charlitha Charleston discovers her inner artist in Prologue Theatre's "Ribbon Around a Bomb"
Remember this post from last week where I suggested five essential rules for startup storefront theatre companies? Prologue Theatre company is knocking it out of the park with numbers 1 and 3. Their succinct, unique and easily-comprehensible mission is to “produce stories from underrepresented voices throughout history.” And this season, they’re focusing on works that explore and celebrate female artists — a community that’s mostly ignored in history books and significantly overshadowed by their male counterparts. They started this season off with a lovely production of Dream of a Common Language, Heather McDonald’s play which examines the life of a repressed French 19th century female painter who gave up her dreams as an artist to be a wife and mother. They continue this theme with Ribbon Around a Bomb — a new musical, written by Jess Eisenberg Chamblee, that tracks the life of a modern, young African American painter named Kalakara as she struggles with discovering who she is as an artist and as a women. To guide her, three life coaches from beyond appear before her to guide her along her way — Tamara de Lempicka, Mary Beale and Artemisia, played by Angela Alise Johnson, Melody Latham and Kathleen Wrinn, respectively. Kalakara (who’s played by three actresses at various stages of her life: Krysten Williams as younger Kalakara, Charlitha Charleston as the teenage Kalakara and Tinuade Oyelowo as the older Kalakara) can see and speak with these three women. They challenge her to work through her abusive past and insecurities to find her voice and vision as an artist. Together, this trio of strong, female artists tell their stories (through song) to open Kalakara’s eyes to the opportunities ahead. It’s an enticing concept, and a story very much worth telling. But here’s the rub: the material is more than rough around the edges, and the execution of it is hesitant and lacking. Chamblee’s score has hints of beauty and power, but often it relies on lackluster lyrics and tinkering melodies to convey some rather complex feelings and thoughts. And while there are a number of really interesting stories to tell (you could make a musical — even an opera — based on just one Kalakara’s mentors) giving them all a voice makes for a cacophony of competing stories that never artfully weave together. As a result, Kalakara’s story is pushed to the background to make way for “show stoppers” from her trio of sister artists, with the only one making a distinct impression being Kathleen Wrinn, who has a strong and unaffected belt/soprano and smart acting chops. I hope to see more of her. Pushing Kalakara’s story aside results in confusion around basic things such as: why is she institutionalized at the end of the play? What causes her sanity break? Is she a lesbian? And, more importantly, why does she even want to be an artist? I didn’t feel I had enough information to be invested in her story. The lovely video preview, below, manages to capture in a few seconds what this show never fully gets to: a quiet and powerful lyrical beauty. I applaud Prologue for their commitment to a worthwhile mision and elevating the awareness of our unsung heroes, but this Bomb doesn’t make the intended impact. Side note: while no fault of Prologue’s, Mary’s Attic is a terrible space for a subtle, introspective musical. The bar staff clomps up and down the steps during quiet passages, people noisily enter the bar venue unaware that a show’s in progress, and, last night, I could clearly hear the balls as they were called in the downstairs bingo game. Nice review, Bob–gives a very good sense of the strengths and limitations of the production.